Wow. A killer DJ interface for use with Traktor 3/Pro is available for use on your iPhone/iPodTouch. This app has been out for a few weeks but I finally ponied up the $6 purchase. First off, I have NO qualms what so ever in doing so. Here’s my attempt at a review. I’ve also made my own templates for T3 and Pro as the ones provided at the iTouchMidi site are incomplete and you may find greater mileage in using mine if you want. Files will be available at the bottom of this post. SO basically, after you purchase from the iPhone App Store (no need to jailbreak) and install it onto your phone, you need to MAKE SURE you have a local working Wireless Connection so that the iTM DJ app can connect to your computer running Traktor (3/Pro). Or. you can use your mac’s built in airport card to ‘create network’. Give it a name..and voila…. fire up iTM DJ app on the iPhone and you should be good to go. Don’t forget to connect to this newly created network on your iPodTouch/iPhone as you may be connected to another normal wi-fi network. You will also need to download the iTouchMidi OS X app from the iTouch Midi site to your computer that will be running Traktor or the Windows version in order for your computer to complete its magic of wirless interface to virtual Midi Port/Interface. In Traktor’s Midi Setup, you will need to select ‘iTouch Midi’ as your Midi in/out Interface. Just above is a screen shot of when you first start up the app on the iPhone, of what you see. Hopefully, you see your computer listed and you can just select your computer and then your off into the actual UI and fun of this app. The process is pretty damn simple. Launch the iTouchMidi app on your computer and then launch iTM DJ on your iPhone. It is pretty much as simple as that. It just works. So next up is the actual UI of iTM DJ. So this screen shot above is slightly different from the one at the top of this review in that it shows two knobs that drop down when you click on the ‘Gains’ button. Clicking the ‘Gains’ Button again and the small panel slides back up and you can fully see the volume controls for your two channels. For my own iTM DJ Templates, I’ve actually re-mapped these controls to Headphone Mix (master/pgm) and Headphone Volume inside of Traktor. I’ve also remapped the ‘EQ’ section a bit differently as well. The Deck A + B channels show 4 knobs in the interface and is quite natural for using the 4 EQ Mixer emulation, but I prefer using 3 Band EQ now as I’d rather apply the top most knob to a Filter Sweep control instead and then use Hi, Mid, Low for the 3 band EQ below that. Mapping is pretty easy in the Traktor Interface so you can modify to suit your own needs / style / use. You got two simple channel faders and 2 headphone cue controls that look fairly obvious for what they are used for. Below that are 3 controls for Load / App Settings / FX which I’ll explain a bit more in a moment. To the left and right of this you have your ‘sync’ button which will …. sync your track to the other deck. Again, obvious and then the ‘Loop’ button engages loop mode to whatever your default loop length setting is here. Unfortunately, there’s no real room here to have much more control with looping functionality like adjust size and position for instance. But, for the basics… dropping a 1 or 2 bar loop is there for you and works great to help you mix in/out of a track when looping is desired. Transport controls and the crossfader take up the bottom portion of the iPhone’s screen real estate. The arrow buttons I believe are suppose to be mapped to ‘Tempo Bend’ forward / backward, but I suppose you could map them to other things like track seek, scratch, etc. These controls were not working properly on the iTouchMidi templates. ‘Cue’ I’ve mapped to ‘Cue/Pause’ and the ‘Play’ I’ve mapped to ‘Play/Pause’. Tapping the middle fader expands out the cross fader control. I’ve found through my use for whatever reason that even though I traditionally use a crossfader, I’m using the Channel Faders for volume instead, because, you still have access to the tempo bend buttons if your mix is starting to drift. But… if you must crossfade, it’s there and just know that you are blocked out of the other transport controls. Two small buttons appear to return you back and minimize the crossfader control. Smart. Now, back to the Load / Settings / FX Buttons. Clicking ‘Load’ offers up the track browsing interface and again obfuscates your transport controls. The two small up/down arrows on the left side are mapped to Traktors browser Tree..so, you can traverse through playlists, track collection, iTunes, Explorer…and the left two up/down buttons are mapped to the track selection browser. In my template, I’ve also added the ‘auto repeat’ function so if you hold down.. the selection will scroll through faster than rather having to click 1 to 1. That can be annoying when you have large playlists. Finally, you see two large ‘Load’ buttons. After finding your track in the browser, click load to load to the appropriate deck in Traktor. Right now, you have to click the small round load button below the headphones to return to the transport controls. Not that big of a deal. The Settings button (what looks like a midi plug/logo) brings up a minimal amount of app settings. I pretty much have left the values to their default and haven’t even bothered changing knob sensitivity. Feels pretty good as is. Click the logo again to return back to the dj mixer. And finally, there’s the FX Section. This just replaces the 4 EQ knobs for 4 Effects knobs. Instead of being defaulted at the 12 O’clock center position, the FX Knobs default to a 7 O’clock position. For my template, I’ve mapped these as Effect knob Amount 1-4 for both decks A + B. There’s no way to enable buttons for FX that are often associated with the fx be it for Traktor 3 or Pro. A bit of a bummer, but, concessions had to be made given the small interface. I could for see dropping the Channel Faders in FX mode and adding 8 buttons instead. I may suggest this to the developer. Well, that pretty much rounds up my thoughts on this nice little app. In use, I actually found it quite enjoyable to play around with. Seriously. I’ve previously used a faderfox DJ1 for many many years and this app almost totally replicates the functionality in software form. $6 vs. $250… From an economic standpoint, this app is a no brainer. If you need real tactile control..then, this app won’t work for you, but if you can deal with the touch screen control, you can dj and… do so well from the palm of you hand. If there’s a way for you to stabilize your phone/touch, you could probably muster 2 simultaneous controls in the interface, but for most of the time.. you are controlling one element at a time and you can jump around to pretty much anywhere you want with ease. The on screen display of numerical values when you move controls is a nice touch too (no pun intended). I could easily see myself in a situation where if I really didn’t want to lug my current controller of choice, the Vestax VCI-100 around, I could use this app instead as a ‘light’ alternative. It will be perfect for impromptu dj sets at the office. If you dj with Traktor and have the iPhone/Touch, I can’t hesitate to NOT recommend purchasing this app. There’s something special / cool / geeky about being able to dj.. and dj house/techno style smoothness with this app. This will basically be the same in Pro, but depends if you are in Advanced or Chained mode. 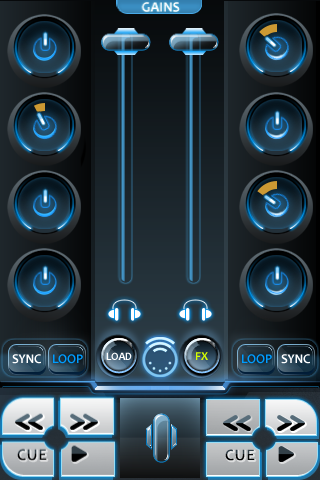 but basically controls the knob parmeters left to right in the app and Top to Bottom mapped in iTM DJ app. I’ve already suggested the developer add 8 Buttons in place of the channel faders to give greater control. Hope to see in a future update. First set of up / down arrows (Left of center) browse traktor tree in left coulmn of Tratkor. Second set of up / down arrows (Right of center) control track browse in main track selection window. added with auto repeat, so you can hold down and scroll through faster. Load buttons of course load into deck A or B.